ISLAMABAD: Federal Minister for Information and Broadcasting Chaudhry Fawad Hussain has stressed the need to boost cultural co-operation between Pakistan and United States and sought assistance from the United States (US) to rejuvenate film and cinema industry in Pakistan. The minister expressed these views in a meeting with US Chargé d Affaires Paul Jones, who called on him in the Capital on Tuesday. The minister said that films were one of the vital mediums to promote the culture and values of any society. Recalling the glorious era of Pakistan’s film industry in the decade of ‘60s, the information minister reiterated that revival of cinema in the country would not only provide entertainment to the people but would also generate economic activities by offering myriads of opportunities including jobs. He said that the government would like to increase cinema screens from 127 to 1,000 which would not only provide jobs to at least 20,000 people but would also make the industry more feasible. Fawad said that Pakistan would welcome any joint venture in the arena of exchange of films and co-productions. The minister said that ministry of information had a key role in countering extremists’ narrative and collaboration in the field of film and media would help in supplementing the efforts to win the war of narratives against extremists and terrorists. The info minister said that Pakistan would highly appreciate US’ co-operation in regards to the establishment of a media university which would impart training to journalists and producers in various mediums as well as in technical and creative aspects. 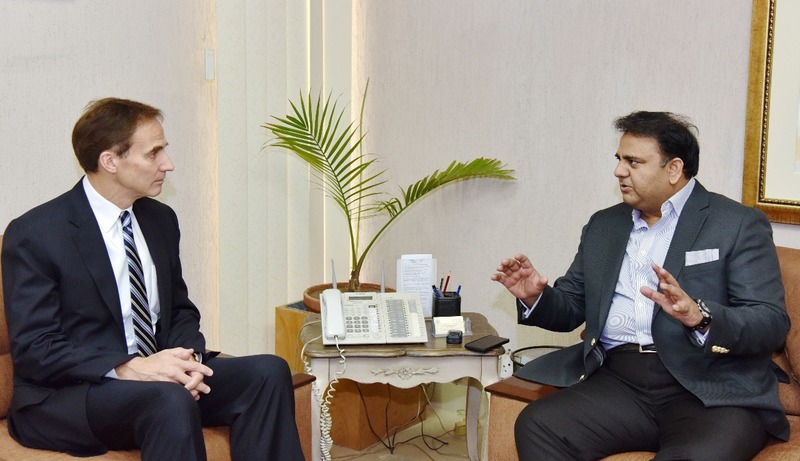 US Chargé d Affaires Paul Jones appreciated the minister’s perspective on closer Pak-US cultural co-operation and the vision of current dispensation in surmounting the challenges presently faced by Pakistan. He said that the US would look into building this relationship in various areas mutually beneficial for both sides. The dignitary also discussed the overall media environment in Pakistan with the information minister. Fawad Hussain further said that media was enjoying unprecedented freedom in Pakistan and the elected government and its institutions believed in free press and freedom of expression. He added that the government acknowledges the role of media as a watchdog and tolerate all kinds of criticism. The minister further said that Prime Minister Imran Khan was keen to improve relations with all neighbours including Afghanistan. He said that Pakistan is a modern democratic state where media and judiciary are independent and all institutions are working in complete harmony.